I’m a little embarrassed to realize that I’ve had my Tentsile Stingray tree tent for over a year and I haven’t published a review! I purchased my Stingray during a sale at the end of 2013, and I’ve collected a lot of images and experiences that I can share. The Tentsile Stingray is listed as a 3-person floating “tree tent,” and is the only 3+ person hammock-style shelter on the market. The first prototypes of the Tentsile hammocks made waves on the internet because of their radical approach to shelter design. 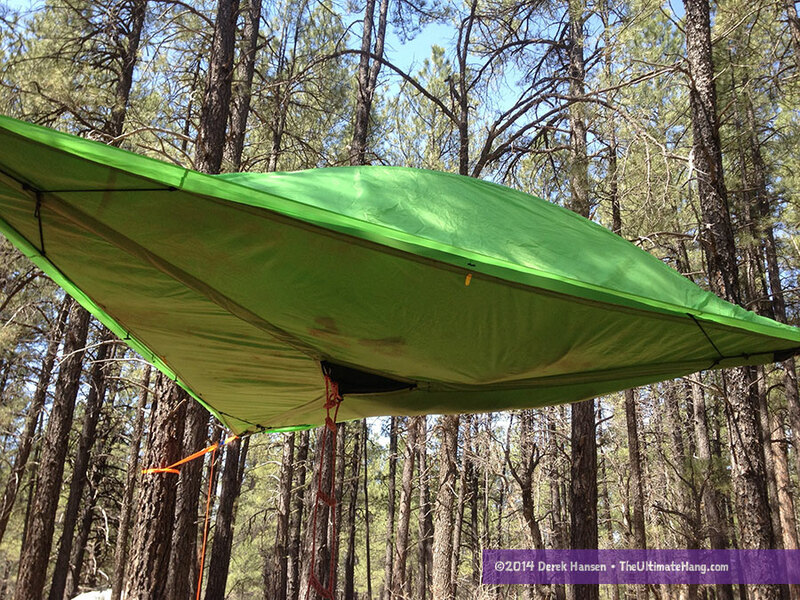 Tentsile has refined the design a lot, focusing on a more simple platform. A lot of comments I read focused on being protected against wild animals in this cool “alien” shelter. In fact, this tent has been dubbed the “alien tent” by my Boy Scout troop and kids. The shelter has three main tie-outs that meet in the center. The design is centered around an equilateral triangle base. Some of my friends who have seen this instantly recall sleeping on a trampoline where everyone eventually sags into the center. The Tentsile prevents this with with sleeping chambers created by the intersection of the tie-outs and the triangle base. All three occupants have their own geometric “hammocks” to sleep in. The main entrance to the shelter is from a triangular hatch at the bottom. On one long edge, there is a zippered door/window sewn into the bug netting that can also be used for access into the shelter. The Stingray comes with an integrated bug netting and a rain fly and all the necessary heavy-duty webbing and ratchet mechanisms to get set-up. 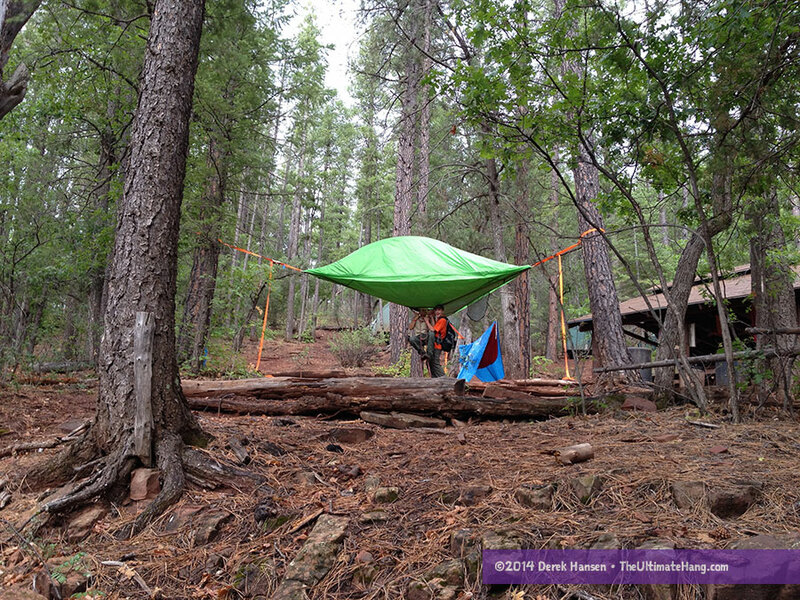 No additional gear is required to set up the shelter. The Stingray is listed as a 3-person shelter with a weight capacity of 880 lbs (400 kg). In terms of floor space, you can fit more people inside, so long as you don’t exceed the recommended capacity. One reason I wanted this shelter is that my all my kids could sleep inside. Smaller kids can fit 2-up in one of the three bed chambers. We’ve had cousin sleep-overs with six kids inside, all having a blast. Speaking about having a blast, this tent has high appeal. No matter where I’ve set it up, it has been the star of the show. At Boy Scout camps, we have to take a lottery to see who could sleep in it, taking turns throughout the week. With family, it’s a regular tree house, fort, base, or alien space ship that has sparked all kinds of imaginative play. The Stingray doesn’t sleep like any hammock you may have seen: bridge, gathered-end, or hybrid. The bed chambers are trapezoidal and have a unique lay. Using under quilts (a common hammock bottom insulator) isn’t really feasible; closed-cell foam or inflatable pads are recommended to stay warm beneath you. There is no “sleeping diagonal” either. The bed chambers have a pocket where you lay. I found one of the more comfortable positions was to hang one tie-out a little higher than the other two and sleep with my feet pointed up to that point and have my torso centered as much in the trapezoid as possible. The Stingray is remarkably easy to set up. I can do it by myself without much effort. The webbing straps have loops sewn into the ends that are used to secure the strap around a tree. The ratchet straps are connected to the tie-out points on the Stingray. I first wrap the straps around each of three trees, about head high, and lay the straps inward so I can access them. I lay out the triangle platform and feed the straps into each ratchet mechanism and pull them all up. In just a few minutes the platform is rising off the ground. Before I tighten the platform completely, I add the tent poles while it is easy to access. I also add the rain fly at this point too, if needed. I have left the rain fly attached for packing and set-up to make it easier on subsequent set-ups. I tighten up the straps as equally and as tight as possible. This is also different from most hammocks, where a suitable sag is required. The Tentsile system is set up more like a slack line, with extreme tension. The shelter is designed for these kind of forces. The hardest part is finding the right trees, and I’ve found this to be the biggest downside to this type of shelter (or any hammock with more than two anchor points). When I first got the Stingray, I went to a local park and spent some time trying to find a perfect set-up. Thankfully I had two sets of straps, so I was able to double some up so I could reach the trees that presented an equilateral triangle setting. I’ve found that if the trees are not in a triangle shape, one edge will sag a little lower than the others and I’ve had one tent pole fall over because the tension wasn’t equal. This didn’t affect the sleepers very much, but it does compromise the design a little and the rain fly is no longer as effective. As I mentioned before, the ratchet suspension system is very easy and quick to set up. I will say that care must be given to ensure the ratchet mechanism is closed and locked in place before loading the shelter. One a father-son camping trip, I didn’t close one strap completely, and we got quite a scare. 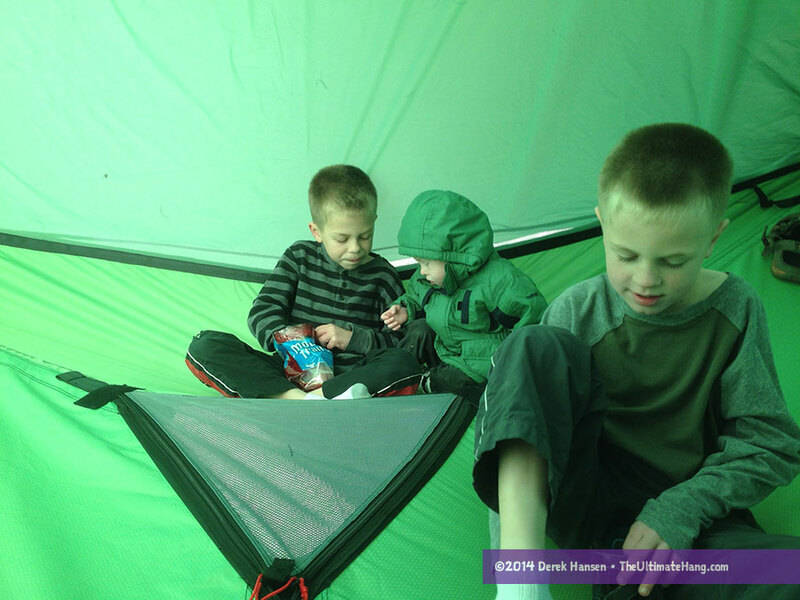 My sons had all climbed up into the shelter and I followed them up to tuck them in. I was standing on a rope ladder (the platform was about 5 ft/152 cm off the ground) when one strap suddenly gave way and my son fell dramatically to the ground, hurting his pelvis. Up to that point, I hadn’t had any issues with the Stingray and I was completely shocked. I discovered my error soon and fixed it. My sons were reluctant to get back in at first, but we had no issues after I secured the ratchet. I must note that this was my problem and inexperience with ratchet systems and I haven’t had any issues since. I just want to make sure no one makes this mistake. The Tentsile shelters can be hung as high as you feel comfortable. Some of the newer models can even be stacked because the bug netting can be removed completely. This allows for multiple platforms to be set up one over the other. Tentsile sells a rope ladder, but I made my own out of 50 ft (15 m) of rope using a simple loop-and-whip method. 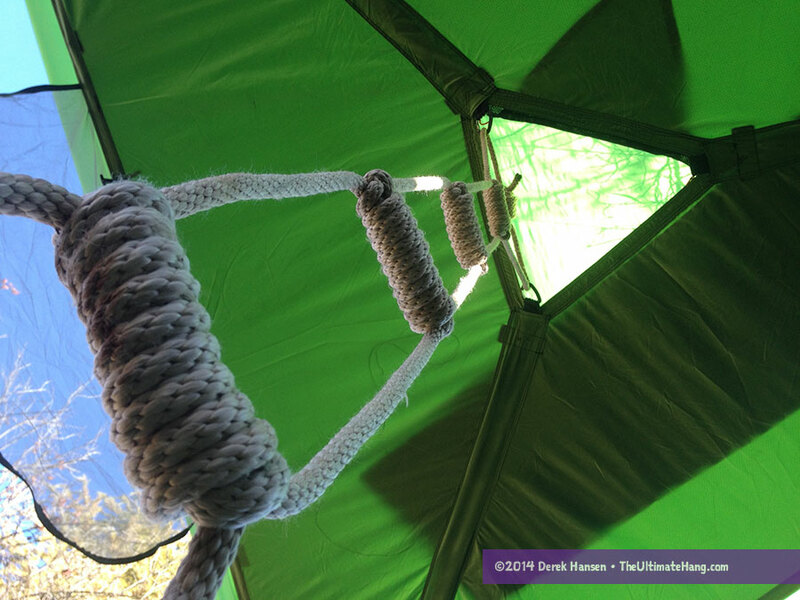 The rope ladder makes it easier to get in and out of the hammock, especially when set up high. One thing I really like about the Stingray is that the long edges are just long enough to set up hammocks underneath. So long as the total weight capacity isn’t reached, this is a great way to extend the overall “occupancy” of the shelter by adding a few hammocks under the Stingray. Even if you don’t actually sleep in the hammocks, you can create a fun lounge area. 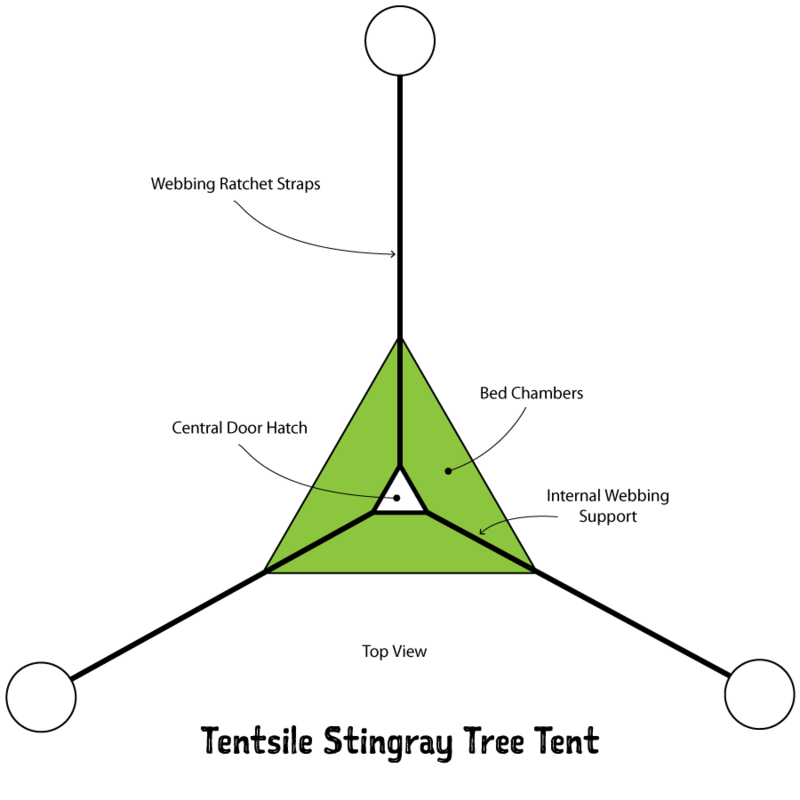 The Stingray creates a canopy that can be used to create a secondary covered gathering area during camp. The Tentsile Stingray is a fun, multi-use shelter that has high repeat appeal. Ideal for car camping adventures where you can find three large, sturdy trees in the right arrangement. Great for family trips. “Only multiperson” seems wrong, Clark has 2 of em. Maybe you meant only 3+? Good review tho. Yes, good point. I was trying to word that correctly. Great review Derek! You mention the best sleeping position you found but how is the actual comfort for a full nights sleep? The biggest challenge, like any hammock, is staying warm underneath, particularly when it is cold outside. Using a thick foam pad helps a lot. In many respects, it does remind me of sleeping on a trampoline since the bed chambers are so taut. 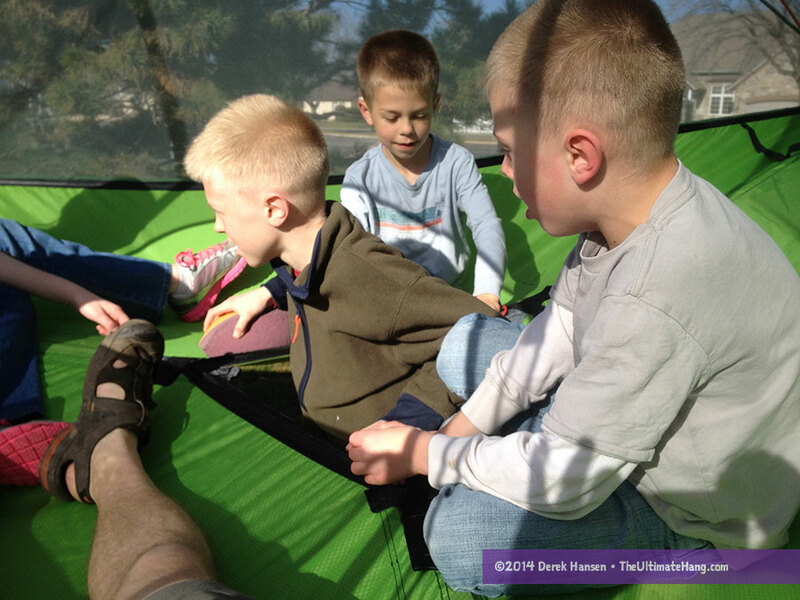 They aren’t as ergonomic as a traditional hammock, but you also aren’t sleeping on the ground. As Alex said below, you can easily sleep on your side, back, or stomach. I have used a military type hammock tent for 20 years and I used a movers blanket folded up three times as my base under my sleeping bag. Since you are highly compressing anything you sleep on, you need to have double the layers. It’s definitely a cool shelter, no doubt about that, but practicality takes quite a hit, I think. Pushing in at 9 kilos, I wonder what’s the heaviest part in the setup? I think we would have all loved to have something like this as kids in our backyard, or somewhere near as a personal little escape room. The ratchet straps certainly add to the hardware, but are essential to the set-up. The material is also very robust, which is needed to withstand the tensile forces. This is more of a car camping tent than something you would slug over your shoulder for any long distance. 1) D-rings at each corner are 2.5 ton rated so hammocks slung beneath the Stingray can all be slept in. That is 6 people! 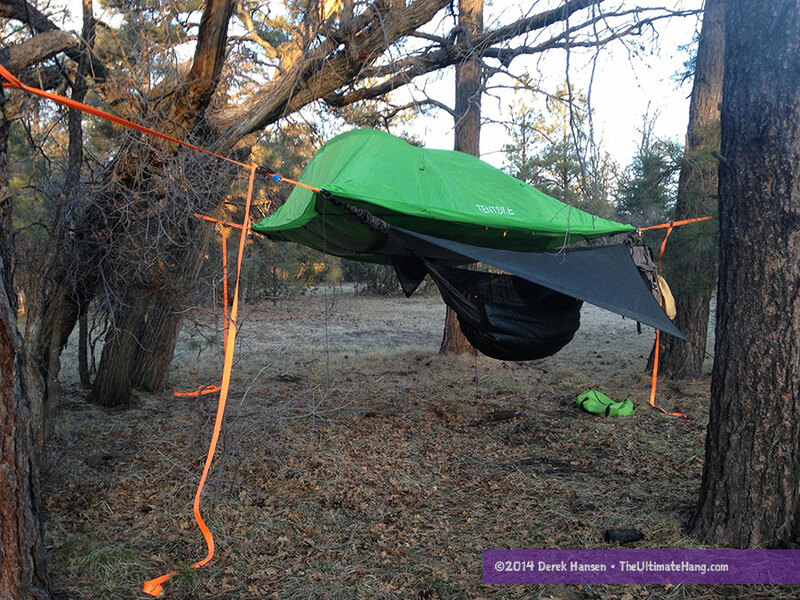 2) rain fly now all extent out so no need for hammock tarps for protection. These extended flaps can also come together under the tent for a full weather seal, wind break to your back and thermal buffer zone. 3) Excellent for back, front or side sleepers. 4) A lot of weight, we understand that and we know it won’t be everyone’s cup of tea. As an ex hammock user, I have made my choice and have never looked back. 5) Now comes with the ability to add spare floors, we had a 12 person rig set up last weekend and it was sweet!!! I have not used the Tentsile but looks exciting. I do have experience with raccoons though. I think that if you were to add a cone protector at each strap and pull up the ladder you would be well protected from racoons, mice and chipmunks. Interesting thought! It is true that small critters could climb across the hammock suspension, but only if there was something to entice them. If you keep all food and smellable items out of the hammock (or tent) you shouldn’t have any issues with critters crossing the suspension. What is “the ability to add spare floors”? Do you mean set up one on top of the other? Essentially, you can stack the newer models one on top of the other. You’ll have to contact the manufacturer. I purchased my Tentsile during a sale event. Prices have come down since then. REI and Backcountry have a sale going on right now with 20% a single item. That certainly helps. I ordered one and expect to receive it in a few days. Great review, I just bought myself one and am loving all of the positive feedback from customers. I like your pictures D.J. I love the concept of these and want to purchase but it goes against everything I’ve been taught about camping out under trees and falling branches. Has anyone been concerned about that? Are you talking about ‘widow makers’? It is a rather rare phenomenon but I understand your concern. Large dead branches overhead are indeed a risk to watch for, but that is true for any kind of outdoor camping, tent or hammock, unless you only camp in large open fields. In my book I talk at more length about the importance of site selection and looking for things like widow makers and avoiding them. With care, you can minimize this risk. What is the size of the center opening? I’m so close to get the actual offers who’s the combo deal stingray. I’m almost 2m height and wondering if the sleeping space will be long enough, without having to fold up. Moreover, have you got any advice to give on the trillium hammock? Jeremy, I think the Tentsile hammocks will fit you fine, but you will be at the limit of the sleeping space. Using a good pad will limit some of the issues you may experience. Each sleeping “pod” is a section of a triangle, so if you angle your body towards the edge of the triangle instead of hanging over the line, you should be fine. I haven’t tested the Trillium version, but it looks like the basic design as all their offerings, with more or less the same structure (plus or minus certain features). I just got my Stingray (via the 20% off sale at REI) and cannot wait to use it. One thing that concerns me is finding the right trio of trees. That extra set of straps is a great idea–where did you get yours? My straps all came from Tensile. I agree: finding the right trees is the most difficult part. Wow – awesome review! This seems to be exactly what I have been looking for, but I do have a question: can a ladder be used with the Connect? Where would you attach it? I know the website says the Connect is only meant to be used at a height of 4 feet. However, the place a plan to use this the most is extremely rugged, hilly, and with thick, low underbrush and smaller trees everywhere – meaning there are literally no ‘clearings’ and I need to go higher. And the Stingray is really too big for my needs. I plan to ask the good folks at Tentsile, but thought I’d pick the brains here, first. 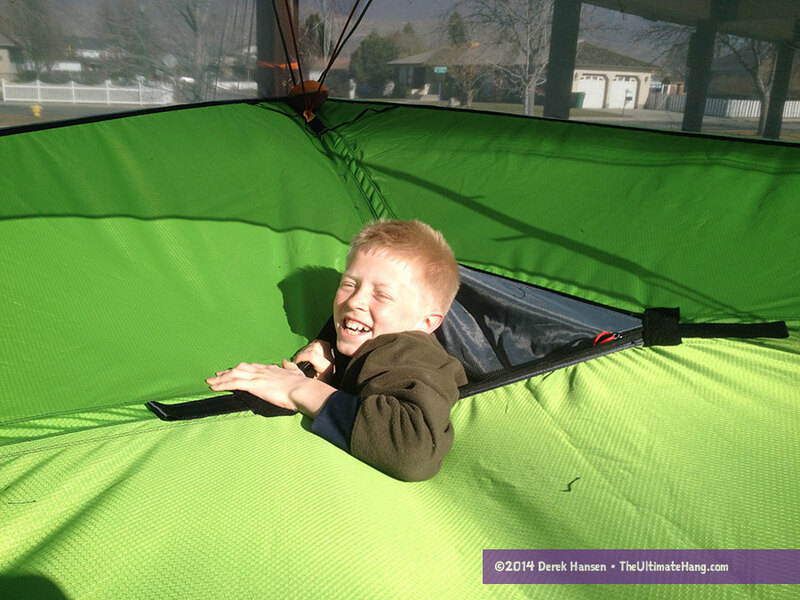 Thanks for reviewing this, it’s swayed me into getting a pre-loved Tentsile connect for camping adventures with my little lad as he grows up. Looks so much fun & adding a new dimension to camping in terms of seeking out suitable spots will be great. I assume that tree protectors will be needed for this? The ones on their website seemed pretty pricey so if they’re needed I’ll have to get creative. 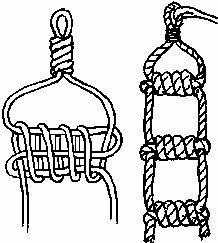 And Im looking forward to making my own rope ladder too…. never thought I’d be doing that in my life. The webbing straps are essential. It should come with straps and ratchets as well. If all you have is the tent, I’d recommend matching what Tentsile offers because you’ll need the weight capacity. It does have the straps and ratchets, I was just wondering about the additional tree protectors that you can buy. I’ve seen some that you can get for slacklines though which has given me an idea about making some. So glad I found this review! Thanks for taking the time to write it (and the great photos!) My primary question had to do with the difficulty of finding the right tree configuration, which you address here. We camp in Wisconsin state forest campgrounds and while there are a lot of big trees in the places we’ve camped, I wondered how much latitude you have with the straps in the event the spacing of three perfectly-positioned trees is far apart. In your pics, it looks like the orange straps are pretty long. Did you mean that you have had to connect an extra set of straps to get the required strap length? The other question I had which the good folks at REI weren’t really able to answer is if we could fit three REI Camp Bed pads in the three sleeping pods? The pads are perfect rectangles and I’m guessing mummy-shaped pads or custom cut foam pads would be a better fit, right? We car camp so Princess (me) can have all her necessary comforts. And on a final note, that hormonal raccoon story plays heavy in the “buy”/”not buy” deliberation for me now. I can’t un-read that. Rectangular pads and bags work fine. The platform hangs fairly flat. Hi. Do you have any experience of using this in winter? Is it rated as 3 season? I live in Sweden and plan to embrace all 4 seasons! In your Flite review you mention replacing some of the straps (not around trees) with Dyneema. Do you think the Stingray benefit from this too? I guess it could, to save weight. Use 1/8 or larger diameter Amsteel. I too have had the Stingray since it was first released and love it. I also have the Tentsile Connect. My only complaint is the one I have with tents as well. The rain fly when installed takes away the view and restricts ventilation needed in the warm summer months. I keep trying to figure out if there is a fly I could buy for use in the summer months to keep the dew out. Help! You’d have to pitch a big tarp over the top instead of connected directly. When properly tensioned what angle from the tree does this hang? I’m wanting to calculate the load for setting up a stand for an event. 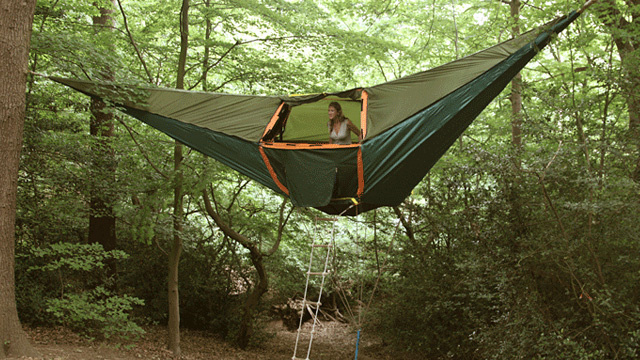 I’ve been considering a tensegrity with individual hammocks but then seeing this makes me want to change the set up. These platforms are set up like slack lines. Very tight. You don’t hang them with an angle per se. So fully loaded at 880lbs that makes like several thousand lbf per line? 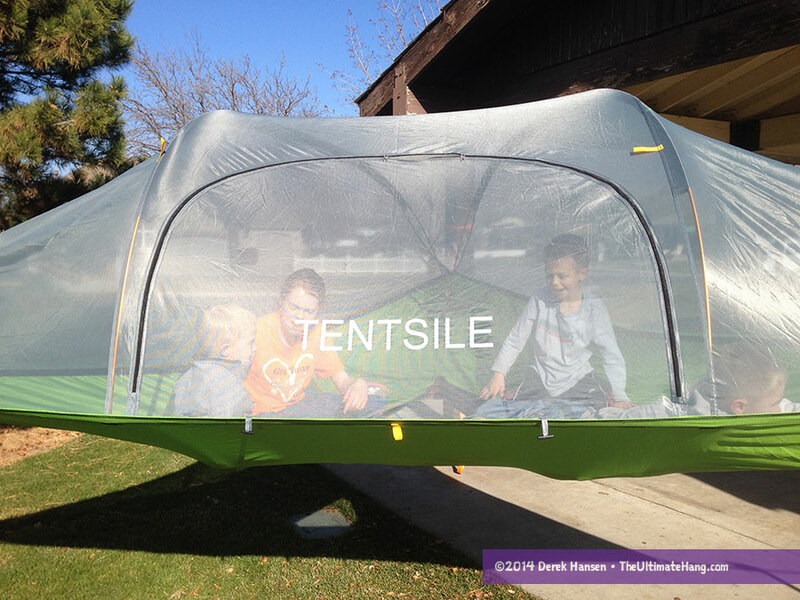 Which one of the Product from tensile would you recommend for 2 persons? It depends. If you plan on hiking in to your campsite, then the Flite. If you are a car camper like me, then definitely the Connect. You will have much more room with the Connect for yourselves, your stuff, and your dog (we have an Aussie). The campsite we use the most is about a quarter mile from the car. Could a small labrador dog, 30 kilo and two adults fit the Flite? We are going to hike for a couple of weeks, so water is already heavy enough to carry with us to some extent… What would you suggest? Or is there any other hammock that could suit us better? It would be tight, but it could fit. I would order one ASAP from a company with a good return policy such as REI, Campsaver, etc. Pitch it in your backyard or local park. It’s good practice and you can climb in to test the comfort level. Has the Stingray been field tested in a tropical rain forest? Very likely. Contact the manufacturer and they will be able to give you details. If no trees to be found, could you not stake the corners on the ground and use it as a conventional tent in a pinch? Hi! Great review! I just tried mine in Sweden and after it had been raining for a night the tent leaked, badly. Puddles inside the tent. Has this ever happened to you? Any advice on how to use it in heavy rain? I haven’t tried the new tarps for the stingray to compare, but I did notice that the corners flatten out and puddle. Try to pull the corners out further if possible. I may need to contact the manufacturer to check. I had the same problem; there are two potential reasons that I know: (1) not having the fly attached properly to the rings leads water into the Stingray from the corners; (2) a fly that was not properly treated. The latter happened to me; I emailed Tentsile and received a new (waterproof!) fly wtihin two weeks. Good luck! Hi! Thanks for your reply. I find the corner quite difficult and I have tightened them properly trying to stretches them so that the water will run off. The problem is the fly, training right through so most likely its faulty. I have had it out for one night and the fly was completely saturated by the top of the entrance. I have emailed them so I hope to get another one! I hope that works! They have pretty good customer service. Good luck! Sounds Good! Thanks for your advice! Hi! Just wanted to update this thread as I spoke with Tentsile and apparently my fly was a part of a bad batch. They imideately said they would send me a new one, no questions asked. Great experience so far :)! Hi, Patrick. That was my experience too-great folks to work with (and a fabulous product!). I’m wondering about sleeping in either the Connect or the Stingray as a couple. It looks like all of the tents kind of force people into separate compartments/”hammocks.” Is it possible to sleep together as a couple without being divided by a nylon strap? Both use separate beds and will have a strap separating them. If you really want to sleep together, but don’t want to be scrunched up together, you’re best off with a tent 🙁 Hammocks “capture” your body weight. Ever slept on a a trampoline with a bunch of friends? If so, you’ll recall how everyone sags together in the middle. This is not cozy. Having separate “beds” for a hammock is ideal. i realy love my stingray !! can you lay over the access hatch. is it possible to end up over the door while sleeping on accident? The Tensile hammocks are built with separate “pods” to sleep in, so rolling over the hatch is difficult, but not impossible. If you have pads, you can maneuver them over the hatch if you want.